Each year, thousands of Boston workers and tens of thousands of Massachusetts laborers are injured in job-related accidents or suffer work-related illnesses. And a closer look at the statistics reveals some interesting details about the most dangerous occupations and the most common types of workplace ailments. In 2016—the most recent year for which comprehensive data is available—injuries that required days away from work, job transfer, or job restriction totaled more than 41,000 in Massachusetts. Injuries that didn’t require time away from work topped 36,000. The same year, 109 workplace fatalities were recorded. Perhaps surprisingly, occupations with high injury rates are not necessarily the most dangerous jobs. For example, nonfatal injuries that required time away from work are most common in the educational and health care services, social assistance, transportation, utilities, and manufacturing industries. Occupational fatalities are more common in industries such as natural resources extraction, construction, building and grounds maintenance, law enforcement, and material moving jobs. Workplace injuries in Massachusetts generally mirror common job-related injuries throughout the country. According to the Insurance Information Institute, non-construction laborers suffer the highest rate of injury, followed by truck drivers, janitors and cleaners, nursing assistants, and general maintenance workers. Sprains, strains, and tears are the most common work-related injuries, according to the Bureau of Labor Statistics (BLS), followed by soreness/pain, cuts and lacerations, contusions, and fractures (broken bones). Between 2012 and 2016, the types of injuries suffered by American workers remained fairly consistent. Massachusetts did distinguish itself in one positive regard: The state’s occupational injury rate is well below the national average. Workers’ compensation provides monetary benefits for medical expenses, lost wages and other costs to workers who are injured or become ill in the course of their employment. When a worker is killed on the job, surviving family members may be entitled to workers’ compensation benefits. Most employers are required to carry workers’ compensation insurance, although there are some exceptions. Employers who fail to meet workers’ compensation regulations could face fines, business suspension, and/or jail time. Workers’ compensation benefits are available to injured employees regardless of fault. While you don’t need an attorney to file a workers’ compensation claim, it is a good idea to consult with a lawyer if you suffered an injury while on the job. Accepting workers’ compensation benefits prevents you from filing a lawsuit against your employer, even if the employer’s negligence contributed to the injury. Hiring a knowledgeable workers’ compensation attorney can help ensure you receive the full benefits to which you’re eligible. An experienced lawyer can also advise you whether the circumstances of your injury warrant pursuing compensation through another means, such as suing your employer or another party whose careless or deliberately harmful action caused the injury. 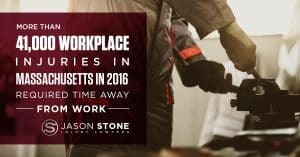 If you suffered a workplace injury, the Boston workers’ compensation attorneys at Jason Stone Injury Lawyers are here to help you understand your options and get the benefits you need. Call us today at 800-577-5188 or contact us online for your free consultation. For more information about workers’ compensation and personal injury issues in Boston and throughout Massachusetts, follow Jason Stone Injury Lawyers on Twitter or “like” us on Facebook.